It’s been a month since I published Darwin’s Inverse Leveraged Short ETF Strategy and the results are astounding. 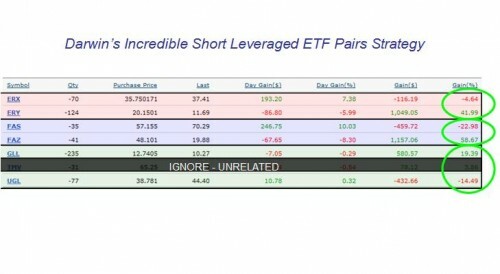 In short (no pun intended), since leveraged ETFs lose value over time due to the simple, yet deceptive properties of daily rebalancing, by shorting opposing leveraged ETF pairs simultaneously, in most markets (MOST), you make money by shorting these depreciating assets to the tune of 11%-50% annualized, depending on what the market is doing. The strategy requires some maintenance in the case of a runaway market like the 65% from the bottom we saw in the 9 months following the March 2009 lows. To recap, here was the table I shared in January with my actual trading account results showing annualized returns of anywhere from 11%-53% depending on the particular ETF pair (full list of all leveraged ETFs ). 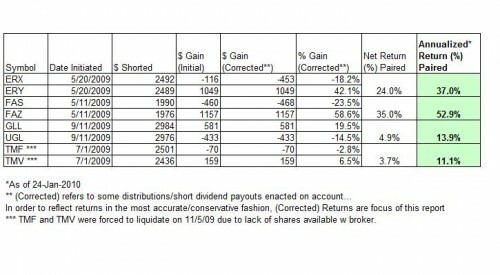 These returns were presented in a conservative fashion, by accounting for distributions for short dividends payments, distributions, etc. For the month of February, I’d like to share how these trades held up in the YTD period for about 2 months’ perspective, and also, share some new short positions I just initiated. In doing so, now I have a mix of commodities, countries and sectors. I had initially considered adding a Currency short pair to the mix (if I could find the shares), but the volatility wasn’t high enough to justify the effort and margin requirements. Even when factoring in the weak dollar trend we’ve seen recent history with the subsequent rebound, the annualized gain over most periods is roughly flat to high single digits. I’m focusing my efforts on a mix of diverse/volatile sectors to optimally exploit this phenomena. I’m going to continue to update on my returns and trades monthly so be sure to Subscribe Here for Free for future updates and also be sure to check out my other project, the ETFBase for new ETF launches, new strategies and market-beating ETFs. Is Now the Time to Short US Treasuries? Can a 130/30 Fund Beat the Market? You Bet! I got burnt bigtime on a AGQ buy-write (my first and – I swore at the time – my last foray into commodities etf’s.) Although, as with most of my losing trades, I violated my own trading rules and also didn’t bother to get a good understanding of the silver market before I pulled the trigger. Thanks for keeping this thread going. It’s good stuff. @Chris, I view the precious metals as more of a weak dollar play than anything. I’ve written a few posts on the correlation between gold, platinum, silver and the weak dollar if you enter into search box. I’d say, understand where our currency’s going before making trades on commodities. I like plat/palladium due to cat converter use in cheap cars being built worldwide. I still see silver as a levered play on gold (higher beta), but I don’t necessarily see gold moving much from here near term. ok, so I read the blog post a few time, understood how it worked and the caveats. Logged into my schwab account and tried to short FAS/FAZ (figured these would be easiest since they had large numbers (relatively) of shares outstanding). I got an messages saying that could not do that, because of the scarcity of these shares, but it did give me a number to call if I was willing to short $100,000 of each. Is this a problem with Schwab? Do I need a different broker? @Cliff, and Morgan – I’m giving away the house here, but I’ve been using Ameritrade and they tend to have the shares to short a few grand here, a few there. I’m probably at like 20K short right now across positions. I did have a position called away once before though. My guess is this can’t be done on a massive scale but for savvy retail investors like ourselves, perhaps it’s a nice additional non-correlated play to boost returns. I just checked with my online broker’s software (thinkorswim), and none of these pairs are available to short. I recall hearing in 2008 that lots of hedge funds were shorting the leveraged financial pair and making money off the volatility. The strategy is good, the details and mechanics can make it difficult to trade in any size. Thanks for ur blog, i find it very interesting. @Peter, Thanks for your comment. I can address all 3. I’ve actually covered the three points in this and the prior post (linked to in this one). Point 1 – That’s accounted for in the 5th column over as “corrected”. The YTD had no such corrections. But the results speak for themselves as reflected in share price change (initial vs current). Point 2 – Not sure what buyins are, but if you’re referring to having the position forcibly closed due to lack of shares to short, that did happen to me. I had highlighted this as a key risk in article #1. It happened on my Treasuries long/short TMF/TMV position. Point 3 – These ETFs don’t trade at a premium or discount to NAV like a closed-end fund for instance. They simply track the underlying index. It is possible that an underlying index runs, like the unprecedented 65% move in the S&P500 from pivot bottom in March. I had highlighted that as a risk as well in article #1 and noted that an options offset strategy could be used to combat/mitigate such a move. You’re right to point out that there’s no free ride, as I also tried to make abundantly clear in article #1. However, it’s working out great for me and with some risk management and close monitoring, it may turn out to be the best trading strategy I ever have, or ever will employ! Since this strategy is not implementable in an IRA, have you considered simply buying puts? See any issues? Darwin – found your blog as I was researching the very same strategy. Thanks for sharing your insight and real-life experience. I am concerned of the hedge ‘breaking down’ in a trending market as you have outlined,. Could you please describe with some detail your options offset strategy for a runaway market? I am not sure on how to figure out the right amounts for a hedge, or at what point should one enter it, or options on what instrument (as the spreads on thinly traded leveraged ETFs are horrendous). As a real life example – if you were short now DPK – DZK , DPK up close to 40% in two weeks – what would you do? Darwin, Thanks for sharing the great idea! I found Schwab is the worst broker for implementing this strategy. Almost 90% of the leveraged ETF pairs aren’t available to short (either long side or short side, or both). E*Trade isn’t too good, either. I couldn’t get any 3X ones but finally made a 2X SP500 pair (SSO & SDS). I also borrowed some shares in 3X financial (FAS & FAZ) from Ameritrade. One thing you didn’t mention is when to close the position or rebalance if it is still making money (for example, when the long side is down 20% and short side is down 70%). Do you suggest a trailing stop? This is fantastic post. It’s the first time I’ve seen someone lay out the nuts and bolts of this strategy. I have seen blog comments on it going back to late 2008 but no one has tried to explain it in detail or evaluate it. Congratulations to the author for a good post. I’ve been using the strategy for one year, since July 2009. Like the author, it has done nothing less than revolutionize the way I invest. I have had extremely positive results. Several comments were asking for some implementation details. I’ll put a few thoughts down based on my own experience. I started with a wide variety of pairs, about 20, but cut back to 8 pairs. I no longer do 2x funds. 3x funds work better (which I knew going in but wanted to see for myself). Also, an underlying with higher volatility is better. That has led me to use mostly FAS/FAZ and TNA/TZA, with a smaller amount of DPK/DZK, CZM/CZI, EDC/EDZ, ERX/ERY, LBJ/LHB, and MWJ/MWN. At first I was shorting each ETF pair. It was working fairly well. I was up about 3.5% in 4 months. However I was paying all kinds of “hard to borrow” fees, which as you might guess is the fee you pay to borrow and short ETFs that are hard to borrow. With most of the ETFs I pay between 2% and 6% but at times it got to 10% or higher. CZM was 25% for a couple days in June. But most stay in the 3-5% range (annualized percentages). I have heard that the cost can go way up with most brokers however. I am at IB. I have the sense that they are much more fair to their customers. There are also “dividends in lieu” which is the dividend I have to pay when the fund has a distribution. Paying out dividends isn’t necessarily bad because the share price drops by a roughly equivalent amount. But it can be bad from a tax perspective. It is essentially trading an investment expense for a capital gain, which can do unexpected things to your taxes (either harmful or helpful depending on your tax situation) which is beyond the scope of this comment. Anyone who wants to implement the strategy, I would urge you to spend some time to understand how you will be taxed. After four months I started using options to implement the strategy, thinking I would avoid both the “hard to borrow” fees and the big distributions. I have also found that my broker is a little easier on my margin with options, which means I can do more. And trust me I do more. I’m so excited about the strategy that I use every last bit of margin available. The last 8 months I’ve been using a combination of options and shorting the ETF. Options have been much better. They have been more profitable, I am able to limit my losses (which is important in a runaway market, as the author importantly pointed out), and they are WAY more fun. Oh, I almost forgot one other benefit. Options can’t be called back. I have had several buybacks (that’s when the broker can’t borrow the shares and closes your position). Buybacks are bad because it leaves one side uncovered, but also because your broker buys back at whatever price the market is offering. That is bad when the spreads are wide. Most of the ETFs that seem to get called back are more thinly traded, meaning wide spreads. With options there is no buyback risk. There is more to the strategy, particularly 1) how to best implement it using options and juicing up the return by collecting some option premium in the process, 2) rebalancing when it gets too far out of whack, and 3) how to minimize risk in conjunction with the rest of your portfolio. I’ll leave the first two points alone for now. On the third point, for the most part the rest of my portfolio is a “typical” diversified long-term portfolio. I like the idea of hedging it a little. As a result I tend to short slightly more FAS than FAZ. I’m up 16% so far, inclusive of all commissions, shorting fees, dividends in lieu, etc. That’s 16% in one year. 16% in one year people! The rest of my portfolio is up over 30% over the same timeframe, but that’s not the point. I would be up the same 16% if the market had been a mirror image of itself and the rest of my portfolio was down 30%. Therein lies the real power of the strategy. It performs the same way regardless of which side of the mirror you’re on. I track the results daily so I can run some statistical analysis. For those that like portfolio statistics, you may be interested to know that the strategy (as I have implemented it – big caveat) has a beta of -0.20 and a DAILY standard deviation of 0.73% (compared to the market portfolio of beta = 1 and st.dev. = 1.21% over the same time period). In other words, the volatiliy is MUCH lower than the market, and the negative beta means it does an incredibly efficient job of lowering volatility in conjunction with a typical long portfolio. Over longer periods of time I would suspect the beta to approach zero. And here’s the real kicker. Alpha = 18.2%. There is not a hedge fund in the world that I would trust to get me alpha = 18.2% with significantly lower volatility than the market and negative beta. Granted this is only over a 12 month period. But there are a couple reasons to believe the numbers will only get better. First, the strategy does well in volatility and less well in one-way movement. The first 6 months (July 2009 to Jan 2010) had nearly one-way movement up, and yet the strategy did okay. In a more volatile or sideways market it will do better. Second, I can implement the strategy much better now than when I started, which means my returns should get better. And like the author mentioned in one of his posts, the real icing on the cake is that the strategy would have made 16% even if the market had been a mirror image of itself. That’s powerful. Is it OK for you to share a little about using options to implement this strategy? I can think of couple of ways but figure out they are not easy to get profitable. 1) Short ETF pair and buy calls to protect. Problem: out-of-money calls are so expensive. 2) Buy out-of-money calls and short in-the-money calls to form a bear credit spread. Idea: Time premium collected from the short side should be equal to cover the time premium on the long side (for normal stocks). Problem: out-of-money calls have far more expensive time premiums than in-the-money calls for these leveraged ETFs. 3) Buy in-the-money puts and short out-of-money puts to form a bear debit spread. Problem: Similar to the problem of calls, in-the-money puts have far more expensive time premiums than out-of-money puts. 4) Buy and short out-of-money puts to form a bear debit spread. Problem: Such a spread costs a lot! Sometime it could be more than the spread itself. Your opinion will be highly appreciated! I have approached it a couple ways. Primarily I have written deep ITM naked calls. I know somebody’s going to respond that naked calls are dangerous and all that. Yea I get it. It turns out they are not very dangerous when you have an offsetting naked call and you know what you’re doing. You want to write both pairs enough ITM that both will be exercised. Otherwise, when the price of one side drops below your strike price, you’re no longer making any money on that side. But of course you’re continuing to lose money on the other side as the price rises. As a result you choose options with delta close to one and you don’t get to collect as much premium, but you still get a little. Psychologically I love the idea of collecting premium every month. I have had to take protective action on a few occasions but not as much as you’d think. 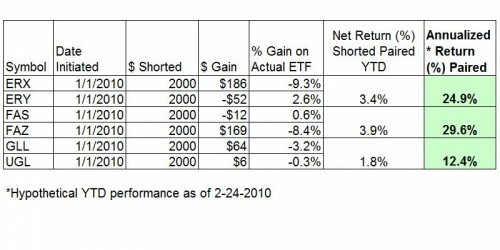 Even during the run up last half of 2009 for the most part I found there was sufficient volatility to keep both sides within shouting distance of each other and make the stategy profitable despite the rising price of the long ETF. I experimented with near months and far months. I haven’t attempted to calculate with much rigor which is best. The nice thing about near months is you get a “do over” on a strike price every month. Going out several months or using LEAPS is more dangerous because there is enough time for the price of one side to drop below your strike. This is probably reason enough to use exclusively the closest month, or go out at most two months if your commissions are high. Another reason is that the further out you go, the options have priced in an expectation that the price of the underlying will decrease. This is less true of the near month. As long as you keep writing new options every month, you are getting the benefit of the long-term decrease in the underlying without paying a lot of premium for it (or, equivalently, without losing quite so much of the premium that you would otherwise be collecing). More recently I have been using bear credit spreads (your number 2). As you suggested, you can use puts to do the same thing (your number 3). Put-call parity means they should be equivalent. It is hard to collect much premium this way. Usually you end up paying premium, unless your OTM call is high. Which of course increases the risk. I design my strikes so that the maximum I can lose on one side is roughly counterbalanced by a gain on the other side. As a result I don’t like my OTM call to be too high. It’s impossible (I think) to turn it into a no-lose strategy, but you can limit your losses to very reasonable amounts this way. Numbers 2 and 3 have one other important advantage over naked calls or shorting the ETF directly. The margin requirement typically is much lower (depending on how wide your spread). That means I can do much more. Your number 1 (shorting ETF and buying protective calls) has the same problems as simply shorting the ETF, with the exception that you have some protection in a one-way market. You still have to worry about hard to borrow fees, distributions, and buy-ins. With your number 4 (OTM puts) you’re right you won’t make much if you transact at the edges of the spread. If you are able to buy at the midpoint, you could make it profitable. Myself, I would be hesitant to try unless my broker had technology that allowed me to place a combo order (e.g. I choose a limit price for the combo rather than for each side, and either I get both sides or neither). If you try to put one side in place and then the other, you may find yourself with one side in place and trying to get the second side in place but unable to get a price at which the strategy can be profitable. Note that number 4 and number 3 are qualitatively the same. The only difference is one has a higher strike price than the other for one put. Let me know if you have any follow up thoughts. Hi Jeff, thank you for sharing your experience. Could you shed some light on a few things I don’t understand? And what do you mean by an offsetting naked call? I write deep ITM in order to simulate being short the stock. You could do it with far OTM calls too. You wouldn’t stand to make as much but you’d have a buffer in case the market went strongly one way. It would be lower risk lower return. By offsetting naked call I meant that my FAS naked call offsets my FAZ naked call (at least until financials move strongly one way and then they don’t offset anymore). I’m interested in point 2 of the above. How much does the price of either of FAS or FAZ have to rise by before you will rebalance? Assuming I start off with an equal position size for each of FAZ and FAS (i.e. a 50-50 ratio), I was wondering if I should start rebalancing once I hit a 55-45 ratio or allow for more room, perhaps a 60-40 ratio. Grateful if you could share your experiences on this point. Thanks! Rebalancing is an interesting part of the strategy. On the one hand a failure to rebalance could result in big losses if the market goes one way. On the other hand the strategy doesn’t make anything if you rebalance too often. I haven’t made any kind of objective analysis on how far to let it go. I started in July 2009 as the market was rising. So my long ETFs got bigger than my short ETFs. I was okay letting it go until 65-35 or even 70-30 because it formed a sort of hedge against the rest of my normal long portfolio. On the other hand if the market gone down and the short ETFs got too big, I would probably rebalance sooner. I can see someone using a reasonable rule that they rebalance if the long ETF grows to 70-30 or if the short ETF grows to 60-40. That would make sense if the rest of your portfolio is long. The other aspect of rebalancing is whether to rebalance back to 50-50, or something short of 50-50. I favor the latter because I don’t want to miss out when the underlying reverts to the mean, which is the very essence of the strategy. For example, suppose I get to 70-30 and I want to rebalance. I short only enough of the 30% to bring me to 60-40, rather than going all the way to 50-50. If you use options to implement the strategy, per previous comments in this thread, you can avoid the question of rebalancing all together. More precisely you postpone the question until you roll forward your options, at which time you have to choose whether you do 50-50 again, or roll forward the “out of balance-ness” from the previous month. I hope that makes sense. Why should rebalancing negate the strategy? If the idea is to short equal dollar amounts of a pair, keeping the dollar amounts the same should work fine. Do you have any empirical or mathematical evidence for the negative effect of frequent re-balancing? Thanks. The strategy will lose money if you rebalance every day. Here’s why. If you are 50-50 at the start of a day, you won’t make or lose money that day. Whatever FAS does, FAZ does the opposite and you break even. For example let’s suppose FAS goes up and FAZ goes down. You lose money on FAS and you make money the same amount on FAZ. You haven’t made or lost anything. You are no longer 50-50. You now have more FAS (in other words, you are more short FAS than FAZ). Let’s suppose you end day 1 with 52-48 with more FAS. The second day you hope that FAS “reverts to the mean” and goes down. Since you are more short FAS than FAZ, you stand to make more when FAS goes down than you lose by FAZ going up. That is the essence of the strategy. Now, what would happen if you had rebalanced to 50-50 at the end of day 1? You would break even on day 2 also. And if you rebalanced at the end of day 2, you would break even on day 3. You would never profit from reversion to the mean. You would never lose big money either. All you would do is run up commissions. My previous reply was to Jeff (and not to myself :-P). Sorry about the mis-click. Thanks for the reply. I arrived at this strategy independently, and my analysis indicated that the profit was from the imperfection on the leveraged etf side, rather than the trader’s taking advantage of mean reversion per se. However, even in my analysis, you can of course re-balance frequently enough to lose all your profit to commissions. I made a cursory test of the idea using synthetic short via options (on paper), and the strategy seemed to return net negative or at best a wash on average. In retrospect that made sense, since any predictable imperfections in the underlying can be compensated by options pricing whereas the etf itself is bound by pretty immovable constraints in the way it has to work. I am intrigued that you are able to generate consistent income from this strategy via options. My current understanding would lead me to believe that you are either taking some other risk and are getting compensated for that (which the market would eventually take back in the absence of an edge in predicting market direction or lack thereof), or you are going so deep in the money that in effect you are selling stocks with a modest leverage (but then one would have to split the wide bid-ask at deep-in-the-money options pretty close to the middle to make it work). I am currently testing my thoughts empirically, and as always I am willing to admit being wrong at the face of evidence (better than losing money). Good luck. The strategy doesn’t rely on any imperfection with the ETF. It relies on a well known problem in finance commonly called the “constant leverage trap.” Since these funds are maintaining constant leverage, their price suffers a “volatility drag.” As long as there is sufficient volatility (roughly speaking, reversion to the mean) the price will go down. However, if the market moves strongly in one direction over a period of several days or weeks, the fund will overcome the volatility drag and, due to compounding, its price can rise dramatically. Since I’m short, I lose when the price rises. That is the risk for which I am being compensated. It is essentially a bet on volatility (or reversion to the mean) and against a strong movement in either direction. Not unlike a short straddle. I’ve been trying this strategy myself and only recently think that I have worked the bugs out. I’m questioning Jeff’s reason why daily rebalancing doesn’t work. I don’t think the reason is commissions, I think that it doesn’t work because simple rebalancing puts you in losing trades (you’re selling the one that’s down or buying the one that’s up), as well as the spread working against you. It seems to me that rebalancing–definitely not daily–has to be done with both ETFs—on days when the pair goes up in price, open the position more, and on days when the pair goes down in price (most days), buy to close both ETFs, either partially or fully. I agree with adding when the pair is up and trimming when it’s down. And I would rebalance regardless if it’s too far out of balance. It’s a matter of safety. Let me clarify my earlier comment. I wasn’t implying that commissions are the reason you wouldn’t make money. Daily rebalancing is the reason. Setting aside commissions for a moment, if you rebalance back to 50-50 at the end of each day, you will never gain or lose anything. Each day, your gain on FAS will be offset by your loss on FAZ, or vice versa. Once commissions and spreads are considered, you will have a loss equal to the commissions and spreads. But commissions are not the culprit. The culprit is daily rebalancing. It interferes with the mechanism that makes the strategy work. I have been experimenting with this strategy with a portfolio of liquid and shortable leveraged etfs. It is by no means a money tree. If the volatility is not large enough with respect to the trend, you end up rebalancing, each time taking a small loss. Rebalancing, when done solely to prevent one side from getting too big relative to the other, is often an acceptance of “defeat”. You take your loss because of the relentless trend, and restart. If you were lucky the trend was associated with enough volatility to reduce losses. I suppose with enough volatility along the trend, rebalancing need not be a “defeat” or a loss. Anyway, if you don’t rebalance, you will be rewarded if the underlying ever comes back. If not, you are increasing your losses due to compounded returns because of the trend. In effect the trend is going against you and you are hoping for a reversal. You are now far from market-neutral. If the whole idea is to be market neutral, betting on a direction, including a bet on a mean-reverting behavior is against the spirit of the method, and thus inconsistent. So, one is left with the drudgery of watching positions, maintaining a balance that feels comfortable, and hoping for more volatility and less direction. So it’s more like fishing than growing a tree. It seems that if you are uncomfortable with an imbalance that can develop over a few weeks or even months, and are unwilling to take the corresponding losses, this strategy is not for you. In the end, I think this is a strategy with some edge, but the edge is a lot smaller than I first envisioned, and certainly not riskless. It is still trading, pure and simple, and requires the same sort of mental discipline as any other reasonable trading strategy. Now it makes more sense that this technique has not been used to saturation by everyone. It’s not that easy. Thanks for still checking back here and continuing to share your thoughts and findings. I agree with you that at a certain point, rebalancing is necessary if a trend has become extended and you are no longer close to a market neutral position anymore. However one tweak I have done is I have set a certain point to rebalance. For me, when the value of either of FAZ or FAS being shorted hits 56% of the total value of the pair, I will rebalance, but I will not rebalance completely. Instead, I will rebalance from what was a 56%:44% ratio down to 54%:46%. And then I will rebalance again when 56%:44% is hit again. I find that this method gives more “room” for the trend to turn so that there is no “defeat” as you describe. of course, I superimpose a 2% stop loss on top of this, i.e. if at any stage I lose 2% of my account i rebalance to 50%:50% and take the loss, no questions asked, this avoids catastrophic losses. why 56%? : I use 56% as the trigger to rebalance as I noticed that when either of FAZ or FAS hits 56% and the prevailing trend continues, I start to take significantly larger losses from that point thereon. Having used the method above, I have had to rebalance at the 56%:44% mark a few times but happily I have never been “defeated” since July this year ( i.e. had to rebalance back to 50%:50% and take losses) although there were some hairy moements since the upmove from 1040 on SPX to 1220+ SPX recently. Just wanted to share this to see if anyone has any thoughts and perhaps I can refine my methodology as well. Cheers! Thanks Teck, for giving a detailed reply, including explicit numbers from real experience. I have been progressively relaxing my rebalance-trigger range. I did get a small but relatively steady return when I was running it about as tight as you were. Since I started to allow the pairs a bit more freedom, I have to say it didn’t go anywhere net-net. I think it is a combination of markets to trend lately (recent volatility notwithstanding), and an unfortunate coincidence of re-balancing “resets” marking the beginnings and ends of short term trends (as they are likely to do by the nature of what trends do to the balance of a pair), thus always being in a trend. If you are in the “sour spot” (as opposed to the sweet spot) of the volatility, trend, and imbalance-tolerance, it seems you can spin your wheels for an extended period. In other words, if you take the brunt of a trend with little volatility until you can’t take it anymore and re-balance, and your pain threshold happens to correspond to the typical trend duration of the particular underlying, you won’t make much money or lose a little. If you zoom in (i.e. rebalance often), the trend will look less coherent compared to the daily volatility, and you’ll make small steady gains. The gains will be small because the number of periods over which you allowed the volatility decay to happen is small (in the limit where you rebalance every day you have nor profit and no loss, except for commissions and short borrowing interest). If you zoom out, the 10-day or month-long trends and counter trends will give you higher returns in the long run, but at the expense of potentially uncomfortable drawdowns and increased risk. On another note, I also have been doing partial re-balancing on the pairs that are the most out out of balance and “seem” ripe for a counter-move. But then, there comes the directional bet again. I just wrote a lengthy and detailed response to your comment. When I hit submit I was notified that I hadn’t entered my name and email and I lost it all. Ugh. When I’m done being mad I’ll come back. Sorry to hear the mishap. Yes, losing your work like that is extremely frustrating. Please do come back and contribute your response. Sharing our experiences and insights is beneficial to us all, not only by what we take from it, but also by having to clarify our thoughts about the subject when we put them in writing. Hey Jeff, sorry to hear about that.. it happened to me before so I like to obsessively save whatever I have typed to the clipboard every now and then. I am now considering implementing a very simple trend following system to complement the shorting of the leveraged pairs. the basic idea would be that if there is a sustained trend, i take a hit in the leveraged pair shorts, but i make it back through the trend trading. when market goes nowhere, i make money through the leveraged pair shorts. the trick, of cos, is to ensure the gains from the shorts can offset losses from the whipsaws from the trend trading system. AP, I am curious about the precise numerical parameters around which you operate. Do you have a fixed trigger for rebalancing (i.e. for me it is 56:44). If you rebalance, what do you rebalance to? (i.e. for me it is 54:46). do you also set a maximum threshold for losses (for me it’s 2% drawdown from peak equity – not 2% losses as I think I said previously.. my mistake). Results wise, I also wanted to share that I am actually making zilch since mid Oct. The whole period from mid Oct to mid Nov seems like a lost month due to the rally. Previously between July and Oct I was seeing gains of about 20% annualised returns, including commissions and financing charges taken into account. Now I am slightly net short so if the rally resumes it will be sweet. At the beginning I rebalanced fully when the difference was around 10% (i.e. 45:55). I started loosening that in a discretionary way, depending on the history of the pair, but didn’t go beyond 60-40. I treated the pairs as “employees”, firing the ones that often disappeared from the shortables list, had low liquidity, or hadn’t turned a profit over several weeks. Now I am reassessing again by observing how choppy the trends are in the underlying. SP500 has been a narrow, fuzzy straight line since September. Anything based on the overall market would be a poor performer during that time. Unfortunately pairs with good choppiness often have no liquidity. Upon re-reading what you had written here, I have to agree with much of what you said. As for the options part, I will have to think more about what you described. I still need to be convinced that front month options don’t price in volatility decay as efficiently as farther out ones. Wouldn’t that be arbitraged away by the usual suspects? I find it hard to understand how options would allow you to profit from volatility decay on a consistent basis. I guess the proof is in the pudding. I just need to try and see I suppose. At the beginning of my reply above I wrote “Jeff asked:”; I meant “Teck asked:”. Sorry about oopses. Thanks for the interesting comments that square with my experience. I have a question: have any of you found a way to backtest this in an automated way. It clearly won’t work with Strategy Desk. Might it work with thinkorswim? The automated backtesting in thinkorswim is done via Prodigio, but it is still not quite ready for prime time. Among other things, it doesn’t correct for splits or distributions; makes it nasty to backtest meaningfully. There is a neat playback feature in the main thinkorswim platform, which you can use to backtest manually. Actually I might just do that when I have the time. Incidentally, you can forget about shorting 3x leveraged etfs at thinkorswim; it’s not going to happen. You can of course do options, if you choose ones that simulate shorting with very little premium and reasonable spreads involved. Another question: at what time of day have you found it best to rebalance/close/open positions? I don’t think it makes a difference on average. There is no edge coming from this strategy intra-day. You might want to submit limit orders and let the market come to you. I haven’t come up with a “rule” about that yet. It might pay to do some technical analysis about support, resistance etc. In other words, as you get fancier about the method it becomes increasingly like regular trading and less like “set it and forget it”. Another approach is to forgo rebalancing completely, and do “dollar cost averaging”. This assumes that you are willing to start relatively small compared to the maximum amount of margin you want to dedicate to the strategy and let your position(s) build up over time, sampling various points of the market history. You start a new 50-50 position every week, or every month, etc. I am considering switching to something like that. After a sufficient buildup and hopefully some profits, you cut back significantly and start again. Anyone care to comment about that style of investing in this strategy? My initial thought is that this approach is actually similar to starting with a maximum position which your margin allows, and then rebalancing weekly/monthly, because the effect of the new 50-50 positions periodically would be to “rebalance” the short pair such that the ratio of FAS:FAZ would tend towards 50:50 each time. I would think that by starting small, one would actually lose out on the initial profit potential which an initial large position can potentially create. I would also prefer not to rebalance the short pair when there is no need to (the dollar cost averaging approach might result in this). Hence why not start with a near maximum position (giving yourself 10-20% of your margin as room to rebalance if needed) and only rebalance as and when the FAS:FAZ ratio gets too out of whack and only cut back on positions when you have used 100% of your margin? Having said that what advantages do you see in the DCA approach? To me it is highly possible that I missed something.. It seems to me that there are fluctuations about the mean, so we should sell when above the mean and buy to close when below. My problem is in assessing the mean. What does everyone think of normalizing the closing prices to equal dollar amounts and using a moving average of their sum to ID entry/exit points?